Okay, one would think those working in the flooring industry would know their flooring products right? Well think again! I had a flooring rep out here yesterday and realized I knew the answers to my flooring questions more than he did! You’ll remember I’m getting new kitchen and bathroom floors because of the bathtub leak we had several weeks ago….and since I have to have new floors, I want to try and get something I want… not just a replacement floor. This leads us to linoleum. Remember your grandmother’s old avocado & brown, can’t possibly get rid of it because it’s virtually indestructible, floor? Well that’s what I want! Not the avocado & brown part but the vintage look and feel and the durability of the linoleum. LINOLEUM….not vinyl!! I want a cream/white offset with a vintage yellow or green….kinda like this…. I like these colors...I wouldn't want all three, but two together in a diagonal diamond pattern would be terrific! Overall, I definitely want a vintage feel to the floor…not a modern stone or wood look, which is about all I can find in a vinyl! Well, I gave all of this info, pictures included, to my flooring rep and what does he show up with……6 vinyl floor samples! 6! I told him that’s not the look I’m going for and he proceeds to tell me that I can order half & half and then set them on the diagonal pattern and get the same feel! I just looked at him (you can imagine all the pretty things I was thinking in my head) and told him that “NO” it would NOT be the same look at all! So I sent him back to his shop, which is an hour and a half away, to do more research on linoleum! In the meantime, I got online, looked up linoleum, and found that Armstrong has a linoleum line and there is also the Marmoleum line…they even have a Marmoleum click product that is super easy to install…which come to find out, are what my inspiration picture floors are! Now that I have the info., I call a couple of shops here in town and ask if they carry any linoleum or marmoleum flooring. Of course they all say they do, but when I get down there to look at the samples its, you guessed it…. VINYL! So, after educating the flooring co.’s on the differences between vinyl and linoleum, I came home to call up my original flooring guy, led him to the appropriate websites, told him what to call and ask for and wished I wasn’t breastfeeding so I could have a stiff drink! So where did all that get me? Well no where really, I’m still staring at sub floors! But I did get a call from my flooring guy a few minutes ago….he just wanted to let me know he’s checking on that marmalade for me!!! I do believe I’m gonna need more than a stiff drink! Now, for those of you that don’t already know, linoleum is an all natural, biodegradable, antibacterial product that is tougher than tough and wears like the dickens..which is what I need with my brood! It’s made from linseed oil, recycled wood flour, cork dust and limestone. Who knew that going vintage would mean being so eco-friendly and modern! Check out this fabulous product at…..
My flooring rep has actually talked to an Armstrong rep and is now going to show me some samples of the Migrations series (biobased tile)….not sure about this product vs. linoleum…have any suggestions or comments? Thanks for the advice! Sounds like you’ve been on quite a ride, trying to find exactly what you know you want. Sorry to hear that so many flooring reps in your area seem to be poorly educated, since clearly Linoleum is NOT the same as vinyl, and especially considering how long it’s been around, a flooring contractor should know the difference. Marmoleum sure is a great product and if properly installed, will last a loooong time. 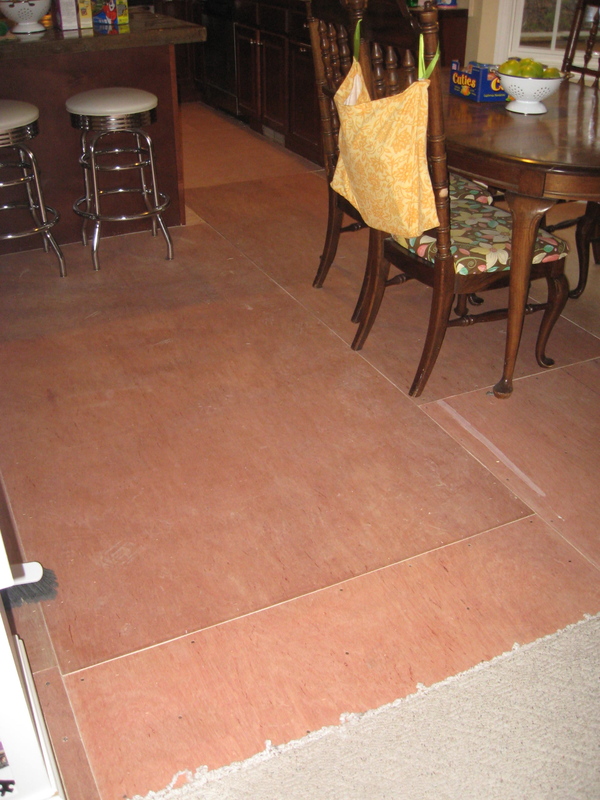 I did take a look at the picture, showing the “subfloor”, which is actually underlayment, and noticed caps in between the boards. I just wanted to give you a heads up and make sure that whoever installs the Linoleum, makes sure those caps are filled in and make a continuous smooth surface, because otherwise every little seam will show through the material. That is of course if we are talking about sheet goods. if you are going with the MarmoleumClick, you won’t have that problem. Thanks so much for the advice! It has been very frustrating…seems like no one around here has ever asked for anything other than vinyl! Now when you say caps, are you talking about the seams in between underlayment pieces? I’m hoping that whatever I end up choosing will be in 12×12 tiles…so this should work…..right? Thanks again for reading & commenting! sorry, that was a typo – I meant to say gaps. Using 12×12 tiles should be OK either way, and again if it is a floating application (“click”) you should be able to just go over it. Any glue-down product however, requires a smooth surface, and gaps in the underlayment could certainly compromise the integrity of the floor. Thanks for the clarification! I will be looking at Marmoleum click tiles on Monday along with Armstrong’s line of BBT! Stay tuned to see how this turns out! Thanks so much for the link to our site. 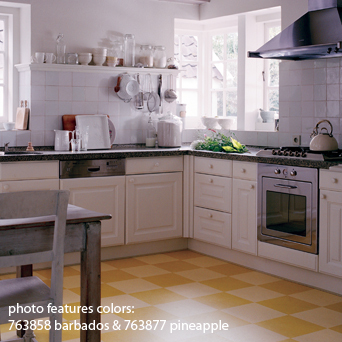 We sell only marmoleum, which is incidentally, THE original marbleized linoleum invented in 1860. No vinyl shenanigans at http://www.coolgreenfloors.com …. only the real deal. We are also open seven days a week and offer free samples as well as closeouts. Checkout our site or ring us up at 1-888-484-5339. Asthma & Allergy Certified …. Marmoleum Click!